Device manufacturers are buying up streaming services, creating an interesting angle in the formula for success in the online audio marketplace. In March HTC bought MOG, now Samsung has picked up mSpot and relaunched it as Music Hub, a music store, locker and streaming service for their Galaxy phone. The service launched in Germany, France, Spain, Italy and the UK, and is not yet available in the US. The service will be offered in both free and premium versions to owners of the new Galaxy S3. By the looks of it, it will try to get users to replace iTunes, Spotify and other streaming services with a one stop “hub” that offers 19 million songs in its catalog. Users can preview, purchase and download songs, store them in their locker, and play them back from their device or other devices or PCs. They can also stream personalized radio channels, get recommendations, build playlists and listen on-demand if they pay the subscription price of 9.99 euros or pounds. While there is no word on why the service is not yet available in the US, it’s easy to suspect that there are licensing negotiations going on. and on. There’s definitely a marketplace out there among device manufacturers for comprehensive streaming services that might be struggling to monetize given their enormous “content acquisition” fees. Mobile device manufacturers know that their customers want to stream content, and they are eager to offer it in a proprietary fashion to enhance the attractiveness of their brand. Dedicated lockers with lots of songs in them create long term relationships with customers, so the cost of acquiring the content and offering the service becomes part of the expense of acquiring and retaining customers. Ads, if they decide to sell them, are gravy rather than bread and butter. Spotify’s General Manager for Europe, Jonathan Forster, will be a keynote speaker at RAIN Summit Europe – the first-ever pan-European conference specifically focused on the fast-growing field of Internet radio – to be held in Berlin, Germany, on Friday, October 5th. As you may have read here before, RAIN Summits are the premiere educational and networking events specifically focused on the Internet radio industry. I’m very involved in RAIN Summits, in fact, I’m the President. So naturally I think they are just great. We’re especially excited about this one because it will be our European debut. RAIN Summit Europe will take place at the award-winning nhow Hotel (“Berlin’s Music and Lifestyle Hotel”). The conference will be a day-long event, including panels, keynote speakers, and various networking opportunities. Spotify’s Forster is responsible for the overall development of Spotify’s European business, leading the strategy and development of advertising sales at Spotify and managing Spotify’s workforce across the region including the UK, France, Spain, Sweden, Norway, Finland, the Netherlands and Denmark. Spotify is the most listened to streaming service in Europe, with more than 20 million registered users worldwide. For more information on the agenda and speakers, visit the RAIN Summit Europe website. Hope to see you there! Broadcast radio revenues grew 1% in the first quarter of 2012, with revenues derived from digital assets at the helm, according to the Radio Advertising Bureau. Digital revenues for broadcasters grew 10% during the same period, or ten times as fast as spot revenue. Network revenues grew 8% and fueled the growth as well. “While advertisers continue to capitalize on Radio’s Spot and Network efficiencies, they’re increasingly utilizing local digital capabilities and audience engagement that this medium affords.” said Erica Farber, the newly appointed President and CEO of the Radio Advertising Bureau. Digital revenue now accounts for more than 4% of radio’s overall revenue. Digital revenue grew 15% in 2011, while spot radio lost 1% and network grew 3%. Digital Revenue is made up of activity generated by websites, Internet/web streaming and HD Radio. Pandora now has more than 150 million registered users, and more than two thirds of that number has listened on a smartphone or tablet. More than 70 percent of all listening to Pandora occurs on a mobile device. To that end, mobile revenues grew from $25 million in 2011 to $100 million in 2012 for the most listened to online radio platform in the US. That puts them second only to Google in terms of mobile advertising revenues, according to a recent press release. This is a good response from Pandora to Wall Street analysts who have been skeptical of the company’s ability to monetize its mobile ad inventory. Pandora also noted that they are now included in the dashboard of 48 models of cars, and have partnerships with 25 brands of autos and auto aftermarket devices. Pandora’s mobile strategy has been a key component of their growth – they were early into the iTunes app store and experienced enormous popularity from the beginning that continues today as a mobile platform. With more than 70% of their listening occurring on mobile, their ability to monetize that listening is critical. $100 million sounds like they are on the right path..
Triton Digital recently announced that they will add standard radio measurement AQH, or Average Quarter Hour, to the ratings metrics offered by their Webcast Metrics server based audience measurement service. In addition to the MRC-accredited audio metric of Average Active Sessions (AAS), customers subscribing to the new Local Reports feature inside of its Webcast Metrics® product will receive Average Quarter-Hour Rating (AQH Rating) by market – the same metrics typically used when measuring analog radio stations. This is actually a return to previous practices for Webcast Metrics – the service originally offered ratings in terms of AQH and Cume, metrics used by traditional radio stations to discuss the size of their audience. Webcast Metrics later began using the AAS term instead. Now subscribers will have access to both terms. This will make it much easier to offer side by side ratings between on-air and online listening to services. That’s what advertisers want to see. “Seeing internet audio in the same terms as traditional radio gives a holistic sense of the audio market, making it easier for buyers to make informed decisions when purchasing ad space,” said Lauren Russo SVP and Director, Audio & Promotions at Horizon Media. “We are excited to see how the ability to provide such a direct comparison will impact advertisers’ views on the value of streaming.” Triton will provide the data to third parties such as advertisers at the request of subscribing stations and platforms. This is a good decision by Triton Digital, one that is meaningful for the Internet radio marketplace in terms of stimulating revenue. While there are some in the industry that may be in favor of keeping everything separate and magnifying the differences between on-air and online listening, it’s all audio in one form or another. Facilitating the use of data so that advertisers can more easily evaluate and invest in the space is a good thing. This decision by Triton is a step in that direction. Hats off..
Targetspot has updated its yearly study of Internet radio listeners. The newly released information was first presented at RAIN Summit West by Targetspot CEO Eyal Goldwerger. Today, the company made the whitepaper more widely available on its website. The benchmark study, done by Parks Associates and with the support of the Interactive Advertising Bureau, was first released at last year’s RAIN Summit West. Results of this year’s update show increased listening, particularly to mobile devices, along with increased social activity and response to audio ads. The findings are all good – the audience is growing, taking Internet radio with them on mobile devices and sharing it with friends on social platforms. Listeners are interacting with their stations, and that’s having a very positive impact on advertising as well. Ad recall and response rates increased 11% since last year, with 58% recalling having seen or heard an Internet Radio ad within the last 30 days compared to 52% in 2011. Of those listeners, 44% responded to an Internet Radio ad in one way or another compared to 40% in 2011, a 10% increase versus last year. 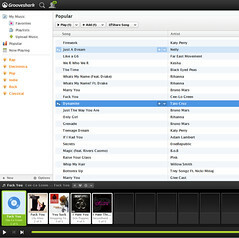 Grooveshark, an on-demand streaming service with a large global audience, is being sued by the four big record labels. They’re the talk of the town when it’s time to discuss services that make it harder for others that follow all the rules to keep listeners happy. Grooveshark takes a bold approach to music licensing, allowing listeners to upload and share music, and other listeners to listen to any song in their library. Artists can ask to have their music taken down, although there are reports that this is easier said than done. Nonetheless there is an extensive explanation of how to do it on their website. I first encountered Grooveshark in 2009 when they contacted me and asked me to write about their service. At the time, since they were running an on-demand service that was pretty unique in the US because it was free, I asked them about their music licenses. They told me they had experimental licenses with the record labels. Shortly after that they were sued by EMI – and I realized that it was experimental licensing on the part of Grooveshark – that they likely had no agreement at all with the labels and were waiting to see what would happen. Stitcher, a service that enables listeners to create personalized podcast playlists, has launched a new service designed to help listeners keep track of their politics. Stitcher Election Center lets listeners follow their favorite political candidates, commentators and topics from one central audio hub and get custom audio updates from favorite news sources like Slate, CBS Radio News, Marketplace, Bloomberg, PRI and MSNBC. In addition to offering updates on candidates from news sources, campaigns can also sign up to offer updates to listeners that follow them. Obama for America is already signed up, and the Romney campaign is coming soon. Stitcher’s niche is its focus on spoken word content and podcasts. They’re the only service concentrating on aggregating that content into an easy to use platform for listeners. With this new offering, they’re actually pulling in content directly from campaigns as well. There’s a large quantity of unique content available in podcast form – from the vast array of NPR offerings, to Fox and CNN, to Rush Limbaugh and Adam Carolla. A few weeks ago at RAIN Summit West, Stitcher Founder and CEO Noah Shanok joined a panel called Innovating the News/Talk Format Online to discuss ways that Talk is becoming more interactive and personalized. Stitcher’s definitely a key player in that effort..